“Around the World” is a fun math worksheet that will have students traveling around the world and back in a fraction of the time it took Phileas Fogg. With clues about the latitude and longitude of each destination, students must arrive at the right location by carrying out simple mathematical operations to find out the exact geographic coordinates of the cities. 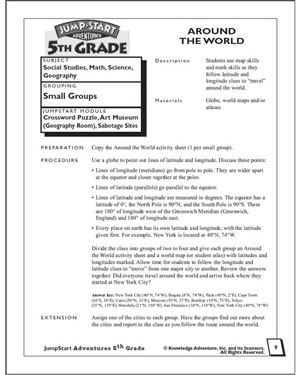 Of course, they will also need to know how to identify a city using only its geographic coordinates in order to successfully complete this worksheet.